Lucky number thirteen, and what a thirteen. I’m going to have a hard time being articulate about this book because all I want to do is cry I loved it so much. After I had finished I closed my kindle and held it close to my heart to revel in the world of the book just a tiny bit longer. It’s hard to describe the plot without giving too much away. And this is a book that unfolds like a flower, each unfolding giving you a better look at the whole image until the last flower unfolds at the end and reveals just how perfect the whole is. It’s one of the few books I’m actually sorry that I was spoiled for by reading reviews, something I normally don’t care about. It’s not that the spoilers ruined the reading experience so much as I wish that I had experienced it once as a perfect unfolding rather then anticipating a particular petal. But a quick overview, two gentlemen with differing types of magic make a bet, they will each train a student and pit those students against each other in a competition. The playing field for that competition is the Circus, and they start to create tents for this circus each one more wondrous then the last. Anymore then that and I’m afraid I’ll spoil something. But why did this book speak to me so much? Part of it is the language. Morgenstern takes care in the words that she lays out on the page, and it shows. It’s lovely, and I am a great appreciator of language. Also, the atmosphere of the circus was so strong I felt that I could almost be there. It is indeed the circus of dreams; where the wonder and magic are actually real and there is no moment of disappointment when you realize that the menagerie tent is simply cobbled together taxidermy pieces. Also adding to the dreamlike atmosphere is the fact that the book is written more as a series of interconnected scenes. You revisit certain characters, but jump across time-back and forth- until the plot reaches it’s peak. 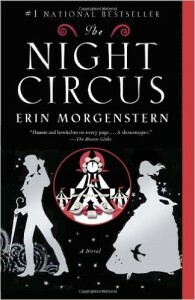 But for all the wonder created by the circus Morgenstern never forgets that magic has a sharp and dangerous edge. There are consequences to the meddling that the two competitors do. Unwitting and unintended consequences, but heartbreaking consequences nonetheless. I’ve read some reviews that said the plot moved too slowly for them to enjoy the book much. It’s a slow build book that’s true, but I enjoyed that aspect. The book is as much an exploration of the circus as it is a story about the circus. Just go, read it. It is a book I will be revisiting soon. It left me feeling bereft that I had finished and delighted that I had discovered it. Share the post "The Circus is a Dream and I am a Dreamer"
I attended a con last weekend dressed as a reveur, my love of this book was so deep. (and no, no one had any idea what I was supposed to be). I’m so glad you loved this book as well, I found it to be a book more concerned with the actions of building its own world, than of moving a plot necessarily. Which totally works for me. That is a really cool costume idea. I may steal it, and I don’t think I’ll mind particularly when no one really gets it. I love this book. I re-read it at the start of January and was reminded of how magical and spell-binding it was. I still wish the romance was more prominent, but I certainly don’t think the pace is too slow. It’s a near-perfect book to me, so glad you liked it too. I thought the pacing was perfect. I like slow build books, but I saw a few negative reviews that mentioned it. But yea, it’s a lovely book. Yes! Sing the praises of this book far and wide! It actually ruined me for reading for quite some time. I wasn’t ready to leave that world and join another. And, as you mentioned, the beauty of her writing in general is something special, and it made it hard to pick up a lesser book. I can understand that. I enjoy reading too much to stop, but the book I read after this one definitely suffered as a result. It’s not a bad book, just not really all that good. Your review made me want to reread this, which I’ve been meaning to do, so thank you! YAY! I kind of want to re-read it myself and I just finished it. Yes! I love this book so very much! Great review. It’s been my dream to get two black and white dogs someday and name them Widget and Poppet.